As I began this crazy journey 22 months ago, I had no idea the true depth of my brain injury. As I look back at those first 10 months or so, I realize just how incredibly foggy my brain was, and how “loopy” I was. In the moment I thought I was “fine” and capable of making important decisions on my own. Looking back, I realize I should have gotten a friend or family member involved in my health care. Between the Chiropractor, neurologist, therapist, and my general practitioner, I had almost 100 doctor visits in that first 10 months. I remember getting extremely frustrated with my Neurologist because I felt like she wasn’t listening to me or believing me. I begged her for help, I asked for some occupational therapy to help with my cognitive and memory problems at my first meeting with her, approx. 10 weeks after my fall. Because there was no damage in my MRI, I feel she just didn’t have the time to be bothered by me. She wanted to “wait” before sending me to any therapies. WHAT?! As I read her reports, she states that I was talking fine and didn’t seem to show any aphasia or timing delays while in her office. Yet, as I listen to podcasts I attempted to record about six months after my fall, I hear it plainly and clearly. Had I had an advocate with me, someone who knew me and knew how “different” I was now, maybe she would have listened. She clearly had no interest in helping me further since I could walk and talk “just fine” (according to her notes). She was much more concerned with treating my whiplash and wanted to give me injections in my neck for the pain. I’m guessing because she knew how to treat the physical problem. Yet, she’s a Neurologist, I expected her to treat my BRAIN. I went back to her again at about my one year mark, explaining to her that I was still having cognitive and memory problems, and that my eye was still bothering (which took me another 10 months and an amazing eye doctor to finally find my Double Vision problems). I asked for vision therapy, occupational therapy, ANYthing that could help me. I pointed out the dent in my forehead and explained how my face looked “twisted” and that I just knew something still wasn’t right with my head. She FINALLY relented and sent me to a Cranial Sacral Therapist (CST). OMG ~ This was the best thing she did for me! Within about two treatments with Greg I was feeling SO much better. Greg took the time to understand what I was feeling, explained to me that he believed me and was there to help me get better! 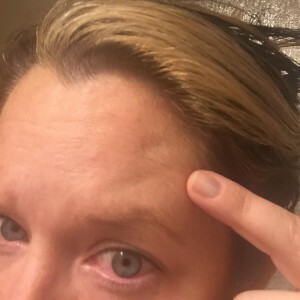 The photo above shows the current dent in my forehead (remember I hit the BACK of my skull on impact) and this dent is tiny compared to where it began. I remember telling my Neurologist that my skull had a dent and a ridge that even my massage therapist was concerned about. Also, that my eye doctor noticed my left eye was shifted higher than my right (and hadn’t been previously). She politely explained that it was almost impossible unless I had a fracture….. UGH!! The CST debunked that statement pretty quickly and said that the plates in our skulls can move around considerably. That that is what was likely causing pressure inside my head. I tell ya, after just a few treatments, the foggy feeling inside my head was almost completely gone!! The moral of my story is that you have to either be able to be your own advocate, or bring someone with you who can help you. You pretty much have to fight tooth and nails with doctors. It seems to me that many docs will just brush you off if they can’t understand or see what your problem is. I am fortunate that I encountered a handful of great docs along the way, and I encourage you to seek out a new doc if you’re not happy with your current!! ← You Must Be Recovered, Right? Amy it stuns me how well you are doing. At 22 mos I was still unable to read anything below a size 22 font in all caps. And then most of what ever it was — I did not understand. I too have had all the issues above, and more. And been told to ‘get over it’. It is tremendously detrimental to those of us suffering — when a physician comes along and is so superior. After 11 years, it gets old. You are so fortunate to be so far along. I still have a lot of trouble with reading, but writing isn’t quite as bothersome (as long as I don’t have to reread it LOL). I have new glasses that help tremendously with computer and book reading, but I still struggle some days with the distance stuff (double vision). My biggest challenges now are still short term memory issues and finding the right words. I also used to be fabulous at remembering faces, now I have to meet someone 5 times or so before I even know there face (let alone their name, but I was never good with names). No two brain injuries are the same, and no two recoveries are the same. Which is what makes it so complicated and complex! I have been my own Advocate for 5 years now and have gotten basically no where. What you are saying about Doctors is true…but when your own Union and Health Plan supersedes the Federal Government and you have tried all and I mean ALL Government Offices to help you and on top of that called ALL TBI Organizations…asking for help….one will find out right away there is no one out there that is willing to help. Just as you can find many Doctors out there that may say, “It’s nothing-let’s wait and see.” There is another set that are afraid to say they just DON’T KNOW! When you hear hesitation or a quick change of subject about a symptom, have your advocate take diligent notes! What a critical message Amy. It is especially helpful that you have walked us through the various roadblocks and successes you encountered and shared your advice through this experience. I particularly liked your suggestion of bringing an advocate with you. I shall absolutely keep this in mind.